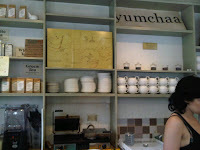 I first came across Yumchaa’s tea at Brick Lane’s Sunday Upmarket. Having sorely missed my previous tea supplier in Nottingham since moving back down South, I was elated to find those familiar brown paper bags of fragrant blends in my local neighbourhood. Having had a good sniff of the varieties on offer I went for their ‘very very berry’ blend and was impressed no end when I got it home to find there were whole dehydrated blackberries in there alongside rooibos and rhubarb amongst other delicious ingredients. Being of an inquisitive nature, I thought I’d look up the website on the front of my innocuous looking tea and was rather pleased to discover that not only does Yumchaa do tea, they do tea rooms! Reading their back story I was pleasantly surprised to find a sense of authentic entrepreneurialism as it seems this small company grew from selling their blends on market stalls throughout London (which they still do, evidently) to a tea shop in Camden, to now having three premises. 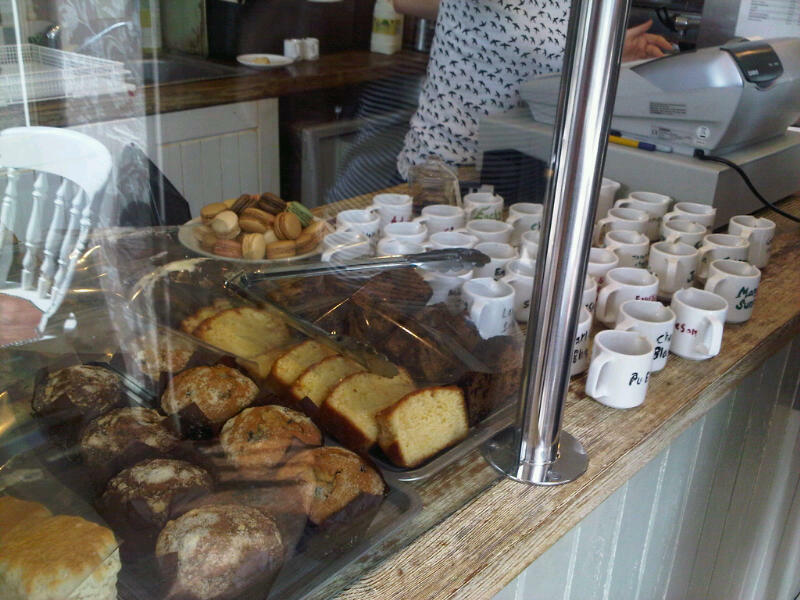 Seeing as I was in the area, I decided to drop in on their Soho shop to see if their cafes live up to their tea. 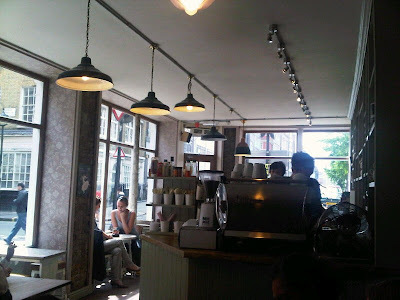 I must say that ‘dropping in’ on a Saturday afternoon is one of harsher ways to judge a cafe as it is usually peak time. But what better way to put somewhere through its paces? Arriving just as an influx of yummy mummies and their curly haired cherubs had descended, I couldn’t have picked a better moment to see how Yumchaa Soho handled the heat. And, although they seemed to have a trainee on the till (which seemed rather ill-advised), they service was attentive and faster than I would have expected. Given the unusually high temperatures for this time of year, I was relieved to find that they served iced teas and coffees. Having sampled their tea blends at home, I opted for an iced latte which went down a treat though my partner had an iced Americano which was odd to say the least and something we won’t be ordering again in a hurry. We didn’t stop to eat but I did have a good look at the choice of fresh bagels, sandwiches and wraps in the fridge which all looked delicious and seemed to go down well with the other punters. The mozzarella, tomato and basil bagel would have been my personal choice – it looked scrummy! 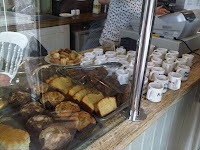 They also had a good variety of cakes and muffins on offer which, had it been a little cooler, would have gone down well I’m sure. 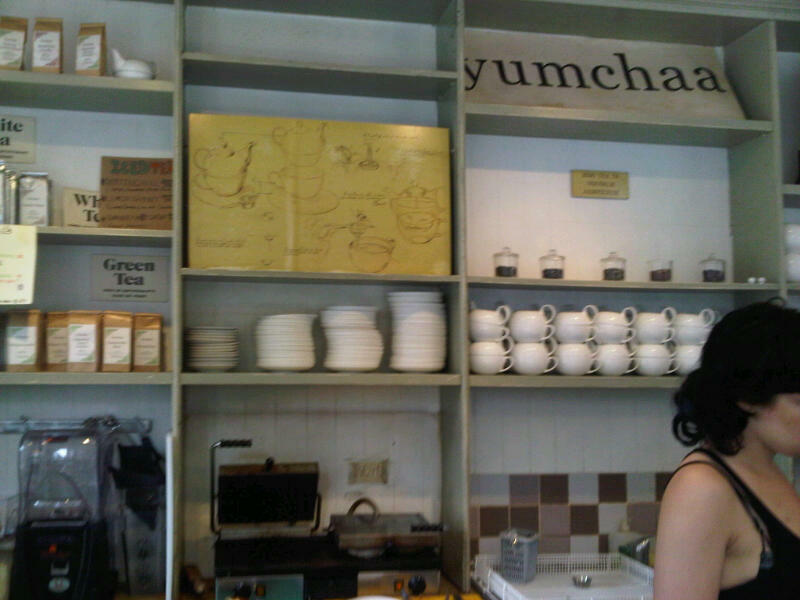 One of my favourite things about Yumchaa is that even in the cafe space the emphasis is still on the tea. The shelves are bedecked with packets of their blends for sale and the counter top adorned with tiny milk jugs filled with teas for you to smell before making your selection. A nice touch I thought. In the otherwise chain-saturated environment of Oxford Street, Yumchaa Soho offers a welcome retreat not too far off the beaten track and is somewhere I’d certainly try again for mid-shop refreshments.